The student team beat out 25 peer schools with its unique take on a job offer letter. 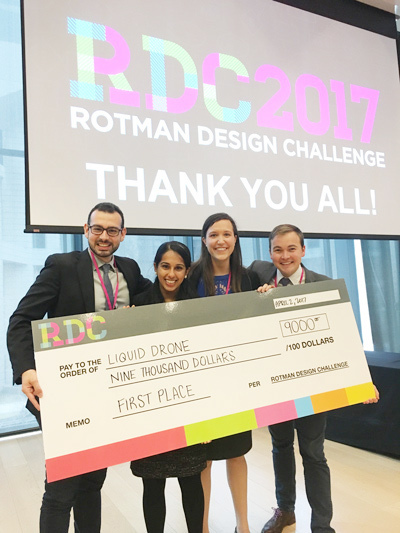 A student team from Northwestern Engineering and the Kellogg School of Management’s MMM Program has won the 2017 Rotman Design Challenge by reimagining a key part of the job recruitment process. Hosted by the Rotman School of Management at the University of Toronto on April 1-2, the Rotman Design Challenge is an international design competition that brings together master’s-level students interested in business and design to tackle a design challenge posed by a sponsor organization. The MMM team — composed of students Nick Anastasiades, Claire Henderson, Michael Perry, and Natasha Singh and advised by MMM Program co-director Greg Holderfield — beat out 25 teams from peer schools with the best business and design solution on behalf of Canadian wireless telecommunications company and challenge sponsor TELUS. A winner of several workplace excellence awards in Canada, TELUS challenged the teams to use design thinking to create a solution that reinforces the company’s strong work culture by helping them attract, develop, and retain top talent over the next five years. The MMM team had four weeks prior to the challenge to conduct interviews, prototype solutions, draft a business strategy, and create a presentation. Leveraging their diverse professional experience in consulting, architecture, and consumer goods and their design thinking skills forged in the MMM Program, the team members connected with TELUS employees, Kellogg students, and human resources professionals to gain unique insights behind the motivations and preferences of today’s job seekers. Inspired by TELUS’ slogan, “The Future is Friendly,” the team’s solution, “The Future Friendly Offer Letter,” reimagines TELUS job offer letters to include a clause that would allow new hires to defer their start date up to two years so they can explore personal passions prior to joining the company. The opportunity offers peace of mind to new hires still interested in personal growth, while strengthening TELUS’ emphasis on employee development and its status as an attractive destination for job seekers. Anastasiades added that the team’s experience in the MMM Program’s Research-Design-Build course taught by Holderfield was instrumental in winning the competition. The program’s holistic curriculum develops whole-brain innovators by emphasizing strategic leadership and design innovation.